The Zika Virus is a mosquito-borne viral infection that is transmitted by the same type of mosquito linked to dengue and chikungunya. Cases have been identified across four continents. It has been detected in more than 20 countries in the Americas, including the United States. One of the major concerns regarding Zika is that its spread may be linked to birth defects such as microcephaly, prompting some countries to advise pregnant women against going to areas where Zika has been detected. Symptoms can include: mild fever, rashes, conjunctivitis, muscle or joint pain, and a general feeling of illness that begins two to seven days after infection. Four out of five people who are infected show no symptoms at all. If you are not a woman of childbearing age, pregnant, or trying to get pregnant, the Zika virus is unlikely to cause you any serious trouble. ZIKV cannot be transmitted from person to person through air, food, or water. Nevertheless, the virus can be transmitted via sexual contact and there are strong indications of infection via blood transfusion. There have been no deaths in Mexico attributed to the Zika Virus so far. Those infected usually just need to take aspirin, drink water, and get lots of rest, but aspirin and NSAIDs should be avoided until dengue can be ruled out. Medicine such as acetaminophen is suggested to relieve fever and pain. Severe disease requiring hospitalization is uncommon. There is no known vaccine or cure for Zika at this time. The National Institute of Allergy and Infectious Diseases is developing a Zika vaccine that shows promise in its first phase of testing. As part of its phase two trial, the NIAID is “currently leading an international effort to evaluate” the vaccine. Mexico is part of this international effort. The Centers for Disease Control (CDC) has no current ZIKV notice for Mexico, but it acknowledges there’s a risk of Zika Virus in the country. Mexico has, and continues to take, steps to prevent the spread of the Zika virus infection through public service announcements, campaigns and preventive travel advisories and warnings. Mexico’s Epidemiological Surveillance System is fully prepared to recognize and diagnose infections by Zika virus. There are currently no restrictions against travelers visiting Mexico. Both the US Government and Mexican authorities have not placed a general restriction on visiting Mexico, only urged caution to prevent mosquito bites. Stay informed about the ZIKV situation as it develops. Prevent mosquito bites by covering exposed skin with sleeved shirts, long pants, and socks. Sleep under a mosquito net to prevent bites. Use Environmental Protection Agency (EPA)-registered insect repellents on exposed skin and reapply as directed. Insect repellents that contain DEET, picaridin, IR3535, or oil of lemon eucalyptus are very effective and safe when used according to the label. If you’re also using sunscreen, apply sunscreen first and insect repellent second. The CDC recommends that women who are pregnant in any trimester consider postponing travel to areas where there’s a risk of Zika virus transmission. If pregnant women do opt to travel to Zika affected areas, the CDC recommends avoiding mosquito bites during their trip. Specific guidance for women who are trying to become pregnant is also included in the CDC advisory. At Journey Mexico we take the health of our clients very seriously, but we strongly believe that the Zika virus does not pose an extraordinary threat to our travelers. We have no known cases of Zika with any of our passengers, staff members, and guides. We continue to monitor Mexico’s specific situation. We advise, as always, to travel sensibly and take precautions to avoid getting mosquito bites, as they can also transmit other diseases, like dengue. We are only recommending that pregnant women consider visiting Mexico at another time in accordance with CDC/WHO advice. If you’re considering Mexico as a destination for future travel, we recommend purchasing travel insurance. The mosquitoes that spread Zika usually do not live at elevations above 6,500 feet (2,000 meters) because of environmental conditions. Travelers whose itineraries are limited to areas above this elevation are at minimal risk of getting Zika from a mosquito. *The categories shown on this map are intended as a general guideline and should not be considered to indicate absolute risk. Elevation may vary within an area to a larger extent than this map can depict. The presence of mosquitoes may change seasonally, with increasing temperatures or rainfall, and may change over time. 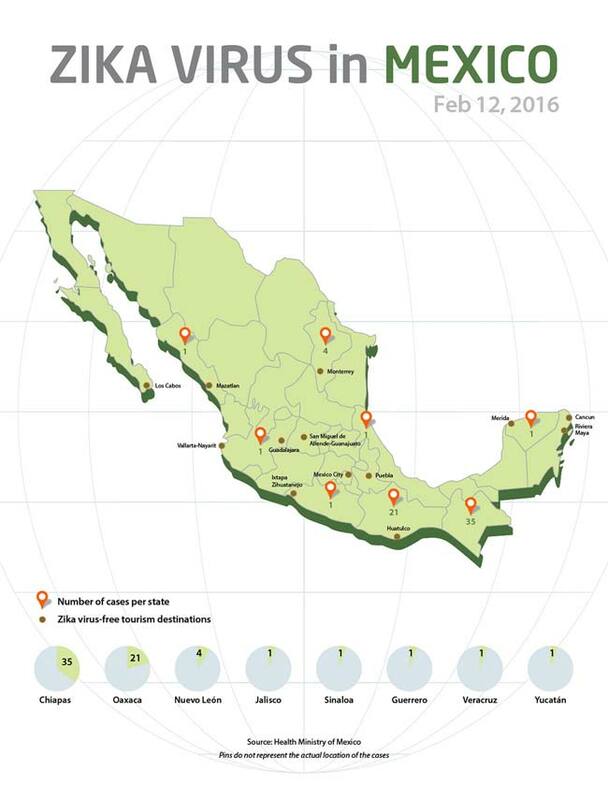 In an effort to help travelers understand precisely where in Mexico cases of the Zika virus have been found the Mexico Tourism Board released a map indicating where Zika has been reported. “All of the resort areas are Zika-free … the Zika problem is not throughout the country,” said Rodolfo Lopez Negrete, CEO of Mexico’s Tourism Board. Negrete noted that there are currently 65 reported Zika cases in Mexico. Of those, 35 are in Chiapas, 21 in Oaxaca, four in Nueva Leon, and one each in Jalisco, Sinaloa, Guerrero, Veracruz and Yucatan. 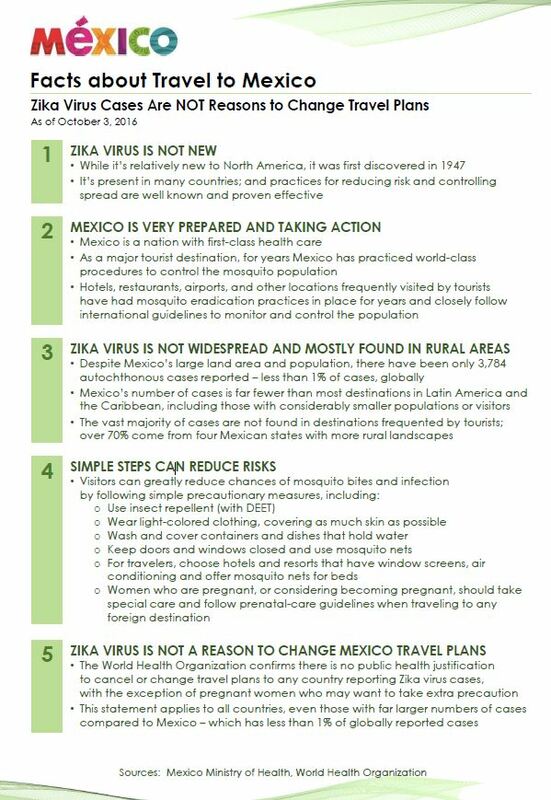 February 9, 2016 – Mexico City – No need to cancel vacation plans to Mexico’s top hot spots as the Mexico Tourism Board continues to improve on efforts to reduce the risk of Zika virus, especially in major international tourism destinations. Through ongoing proactive communications and meetings with tourism destinations and travel partners, the goal is to keep the flow of information sharing open through open dialogue. Preventive measures and educational materials have been developed and disseminated, including posters and key facts; and infection reducing procedures are being reinforced. In a related survey released by the Travel Leader’s Group conducted to gauge the impact of the Zika virus on vacation travel, their findings note the majority of travelers are continuing with their travel plans where there have been confirmed Zika virus cases. The latest reports from Mexico are a total of 65 cases in only 8 states. Of the prior 34 reported cases, patients are on the road to recovery and new cases will be treated immediately. The Zika virus reported is a low-grade strain and non-life threatening. It is important to note that the cases in Mexico represent a nominal percentage (less than .003%) of all the cases, globally. “The reality is Zika virus does not pose a massive risk to health in Mexico,” notes Pablo Kuri Morales, Mexican Undersecretary for Prevention and Health Promotion. The World Health Organization (W.H.O.) February 1, 2016 statement confirms there is no reason to cancel or change travel plans to any country reporting Zika virus cases, including for pregnant women. With this advisory applying to all countries, even those with high numbers of cases, it’s yet another reason that Mexico, with a very low number of cases, continues to be a destination that millions of tourists are visiting each month. February 3, 2015 – Officials from Mexico’s Ministry of Health met with tour operators from the United States and Canada yesterday in Cancun, Mexico, at a meeting organized by the Mexico Tourism Board. The meeting focused on a report of the latest Zika virus facts, the prevention and containment efforts by the Mexican government and tourism industry, and a continued practice of close coordination with the international tourism industry. Dr. Alberto Diaz Quiñonez, Deputy General Director of the Mexican Institute for Diagnostic and Epidemiology, shared that Mexico has only 34 confirmed cases of the Zika virus, representing just 0.03% of the total cases reported globally. All of these cases are from Mexican nationals living in rural areas, far from the tourist destinations frequently visited by international tourists. For several years Mexico’s major tourist destinations and businesses have practiced world- class procedures to control the mosquito population and minimize cases of dengue and other diseases. Hotels, restaurants, airports, and other areas frequently visited by tourists have in place mosquito eradication practices and closely follow international guidelines to monitor and control their growth. Given that the Zika virus is contracted in a manner similar to other mosquito-borne diseases that Mexico has long been combating, the entire country and especially its tourist destinations, are already well prepared to contain this latest disease. Dr. Diaz referenced the World Health Organization (WHO)’s February 1, 2016, statement confirming that there is no reason to cancel or change travel plans to any country reporting Zika cases, including for pregnant women. With this advisory applying to all countries, even those with high numbers of cases, it’s yet another reason that Mexico, with a very low number of cases, continues to be a destination that millions of tourists are visiting each month. Following the meeting, the group of international tour operators affirmed that Mexico’s comprehensive preparations and control measures give them the confidence to continue to recommend travel to Mexico for all tourists. Mexico City, Mexico, January 21, 2016 – The Mexico Tourism Board reported that the Zika virus infection is a new and emerging disease in the country with only a minimal number of cases identified. Epidemiologic studies have found that the virus is under control in the country. With very few cases identified and containment efforts in place the tourism industry in Mexico has not been affected and is not at risk. The Ministry of Health of Mexico launched a variety of measures to maintain epidemiological control of the virus and limit its potential to spread. As the Zika virus infection is similar to that of dengue and chikungunya, prevention programs, health communication activities, and epidemiology screenings implemented since 2014, have helped to minimize the breeding of the Aedes aegypti mosquito in the country. Measures to prevent and control the virus will remain in place to inhibit an outbreak. Additionally, stronger clinical services and operations, epidemiology screenings, health communication programs and vector control efforts have been deployed. The Mexico Tourism Board urges visitors to follow the guidelines presented by the Ministry of Health of Mexico to reduce the chance of mosquito bites. This post was written and published on January 29, 2016. As information continues to evolve with research and reported cases, we will add update this post as best as we can, noting any additions. We recommend the CDC website for the most up to date information. 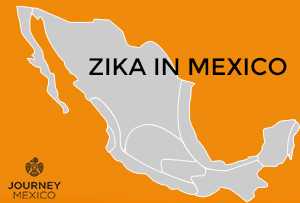 Would you like to receive updates on the Zika situation and other happenings in Mexico? I am wondering where you got the information regarding a confirmed case in the Yuctan Peninsula? I will be traveling there and would like to see the official confirmed case in Yucatan. Thanks. Bird flu, swine flu, virus Ziko what’s next? Can this blog be updated with the latest numbers? There is now reported cases in Cozumel and i like to share the this link with people I know traveling g to have accurate data. Please and thank you! Update As of August 29th, 2,133 cases have been confirmed. How about travel to Baja? From everything I have read it looks like there have not been any confirmed cases of Zika in Baja and no real threat in this area (specifically San Felipe). any updates for Cabo, Baja Sur? travelling there in Novemeber just curious if there have been any confirmed cases? Thanks for your message, according to the most updated report issued by the health secretary in Mexico. The are only 3 cases reported in the whole state of Baja California Sur. If there something else we can help with, please let us know. What about cancun?? Thanks so much! Thank you for your comment and with regard to your doubt, we don’t have any records of Zika cases registered in Puerto Vallarta. In fact, we are constantly reviewing the weekly bulletins issued by the health secretary to verify and update the information in our blog and fortunately, the registered cases are going down. If you have any additional questions, do not hesitate to contact us. I am pregnant and traveling to Riviera maya in July has there been any outbreaks of Zika here ? According to the official record (updated every week) issued by the health secretary. The confirmed cases of Zika are going down. You can check the official information in the following link. If there something else we can do for you, please don’t hesitate to contact us back. Did you end up going to Riviera Maya. I just found out I am also pregnant and my husband and I have a trip booked for September 1st. Just curious. Thanks for your comment, about your question, the number of confirmed cases in Quintana Roo are going down. Have there been any cases of zika in Puerto Penasco? My wife is pregnant and we are visiting in July. Puerto Peñasco is located in the state of Sonora. According to the official bulletin issued by the Health Secretary, there are no cases reported in this state. Thanks for allowing for questions. Are there any confirmed cases of Zika in the Yucatan? My 9-yr-old son is going there for a week in July with his grandparents. Fortunately, none of them are in the potentially-pregnant category, but of course I’m protective of my kid’s health (and old mom’s). Just checking on the current status of Cabo San Lucas/ east cape of Baja..any Zika there? We just check the weekly report issued by the health secretary in Mexico and there aren’t reported cases in Baja California Sur. You can check the complete information in the following link. Hi there. I am just very concern, my family and I are travelling to Sandos Playacar resort in August. I am very excited about it , however i will be 7 months pregnant. Any cases of Zika at or around that area? Let me know .Thanks so much. According to the official information issued by the health secretary in Mexico, the cases in the Mexican Caribbean are going down. You can check more information by state in the following link. Going to Playa del Carmen in August have there been any reports there? Thank you so much in advance! I am also going to Playa del Carmen in august. I cannot read Spanish and the PDF is in espanol. You mention the cases are going down. Can you elaborate? How many cases to date and how many year to date 2017 in this area? My wife and our family are staying at a resort. I assume the resort takes major precautions? If we did not excursions and laid on the poolside he whole time, do you think it would be okay? Alex about your doubts, let me explain that the information provided by the Health Secretary is for state and not specific for a city. The confirmed cases of zika in the whole country had down almost 50% comparing with 2016 and in the state of Quintana Roo, there are only 5 cases confirmed. You can check this information on page 35. Hello I have a 2 week vacation planned to Cancun in mid July. I am pregnant, what are the Zika virus status? Thanks for your comment and according to the information from the health secretary in Mexico. The cases reported are going down. What is the status of Zika in Guadalajara and Zacatecas? In the following link, you can see the complete information issued by the Health Secretary in Mexico. How about Zika in Puerto Escondido? I am pregnant and have a trip planned there for next week! Please advise on any latest info available. Thank you! Here is the updated information issued by the hearth secretary in Mexico. Traveling to Cancun 2nd week of July 2017. I keep on trying that website you provided for updated state by state cases of Zika but the site seems to be not valid. Is there another link? Do you know the prevealence of Zika in Cancun? Will be staying in hotel zone only. If there something else we can do, feel free to keep in touch. I am going to Puerto Vallarta with my pregnant wife on July 2nd for one week. What is the latest Zika virus situation there? You can check the most updated information on confirmed cases of Zika in Mexico in the following link. The report says there are 4 males and 10 females infected with Zika in Jalisco. Since Jalisco is so big, how do I find out if anyone local in Puerto Vallarta specifically has gotten Zika? I am planning a trip to Mexico City and Oaxaca on July 17 and through August 19. What is the situation with Zika virus in these two locations? Hi there! I was wondering if there was any update on the Zika virus in Rocky Point, Sonora, Mexico. My family and I are traveling there July 23rd-28th. I will be 8-9 months pregnant and my doctor advised me to do some research. Thank you! Much appreciated! According to with the information issued by the Health Secretary in Mexico, there are not reported cases of Zika in Sonora. I am planning on traveling to Puerta Vallarta in November for my own wedding and am staying at a resort there on the coast. I will be 6 months pregnant. Any updates on cases in Puerta Vallarta and advice on risks in November ? I know the mosquito rate is down in November. I called the resort and they didn’t seem concerned at all about Zika. Thanks for your comment and congratulation for your wedding. About your concern, in general, the confirmed cases of Zika in Mexico are going down and you are right, mosquito propagation in November is very low since the rains are very sporadic and in addition, the health secretary runs several campaigns to eradicate mosquito breeding sites. Hi! I am travelling to Cabo San Lucas late August early September this year (2017). Should I be worried about getting the zika virus. Is it still safe to go? Thanks for your comments, about your question, there are not confirmed cases of Zika in Baja California Sur. My wife and I are staying at The Royale (Real Club) in Playa Del Carmen and she just got three mosquitoes bites and is quite afraid of getting Zika virus or pregnant and Zika. How many reports have been from this area? I hope you had had a wonderful time in Mexico, about your question, the information provided by the health secretary in Mexico is presented by state and not by each city. Hi, I will be traveling to Puerto Vallarta and Guadalajara this upcoming Monday. Have there been any new concerning updates about Zika in these regions? Is there a link to the most updated report from the health secretary in Mexico? Thank you. Hi! My family and I will be traveling to Celaya the first week of September. As far as I can see on the link you’ve provided, it looks like there are no cases in Guanajuato. Is this correct? I could potentially be pregnant and obviously will take the necessary precautions but obviouslywould prefer if there were no cases! The information provided by the health secretary in Mexico is updating every week. But yes, there are no confirmed cases of Zika in Guanajuato, below you will find the most updated report. Hi!!! I’m currently 18 weeks pregnant and family emergency came up. I need to travel to Santiago Maravatio, Guanajuato this upcoming saturday July 22. I wanted to know if I’m at risk for the zika virus? I don’t want to risk it and travel. Thank you. Thanks for your comment, Rosi, according to the information issued by the Health Secretary in Mexico, There haven’t been any Zika cases in Guanajuato. have there been any confirmed cases of Zika in Cancun for 2017. I read the above report but it just states for the Yucatan as a whole. I am planning to travel this Sunday and am 3 months pregnant. As we have mentioned in previous comments, the official information provided by the Health Secretary in Mexico is per state and not for each city. But as you can see in the reports, the numbers of cases reported in the whole state of Yucatan is very down. Hello, my husband and I are planning on going to Puerto Penasco and staying in a really nice resort there the end of October and I will be around 15 weeks pregnant at the time. Have there been any cases of Zika in that area and are the resorts taking precautions to help keep the mosquitoes down? Thanks! Thanks for your comment and interest in Mexico, about your concern, there are no confirmed cases of Zika in Sonora. Planning a trip for a wedding at the end of January 2018 to Playa Del Carmen. My husband and I are planning to be pregnant with our next baby by then, is Playa Del Carmen a risky area for mosquitoes, is January a risky time for mosquitoes and is Zika transmission common in this area? Any response would be greatly appreciated, thank you! About your travel dates, during the winter the mosquitoes propagation is very low because of the rains are very sporadic and there are no mosquitos breeding sites. Traveling to Cozumel next week – Mid August. We will be staying by the beach. Is Cozumel pretty safe for Zika at this time? Again, we are worried about my wife and myself catching Zika as we want to have another child in a few months. We will be taking precautions 50% DEET staying away from the jungle/forest area and sticking to the beach. Any advice or info would be awesome! We hope you enjoy your travel to Mexico and have a great experience in Cozumel. About your concern, the number of cases in Quintana Roo is going down and the health secretary is running different campaigns to reduce the mosquitos propagation. in the following link, there is an interesting info on how to avoid mosquito bites. Hi, we’re planing on traveling to Puerto Vallarta in Oct. I looked at the weekly updates and I understand that in the document the number of Zika cases are reported by state, not city. Is there somewhere I can find the cases by city? Also, would you suggest contacting the resort to find out what mosquito prevention measures are being taken? Thank you. As you might saw on the reports, the cases of Zika are going in all the states. Alissa, the health secretary only provide online the information by states, and information for each city is necessary to contact the local health secretary office (no all the office have people who speak English). We recommend you to contact your resort and asked if they receive some updates for the city or check what are the prevention measures they are taking for the guests. As we had mentioned in previous comments, the numbers of cases reported on the Riviera Maya has been decreasing. Even though we highly recommend you to follow our recommendation and use an insect repellent to avoid mosquitoes bites. We hope you enjoy your time and Mexico and have a wonderful vacation. We are planning a trip to Los Cabos in late December for New Years. I am of child bearing age and may be pregnant at that time. Is there any information on Zika for Baja California Dur? Also, what is the mosquito population for that time of year there? According to the most updated report issued by the Health Secretary in Mexico, there are no cases reported in the states of Baja California Sur. During the winter the mosquito population is very low, due to the rains are very sporadic. We hope you enjoy your stay in Mexico. We really hope you enjoy your stay in the beautiful state of Michoacán. I am pregnant and am planning to travel to Monterrey in November. Are there any Zika cases in Monterrey? But, keep in mind that during the winter, the mosquito population goes down because of the rains are very sporadic and there are no mosquitos breedings. We hope you enjoy a wonderful time in Monterey. My family and I will be going to Puerto Vallarta on September 29th for a week and staying at the Vidanta Nuevo Vallarta. How many cases of Zika have been reported in this area? And is it a very big concern at this time? We are planning on getting pregnant in the near future and would appreciate as much information as possible. We hope you enjoy a wonderful time in Mexico. About your concern, there are some cases reported in the whole state of Jalisco, not just in Puerto Vallarta. Shally, as you might know, during the rainy season the mosquitos are more frequent, but most of the hotels and the local health secretary are prepared to avoid the mosquito breeding sites and if you follow the recommendations mention on the blog, we are sure that you will have a wonderful in Puerto Vallarta. Hi. I am travelling to Mexico in just over a week for my wedding in Riviera maya. Quinta roo. I am hoping to get pregnant asap. Can you give me some information on zika in the area? Thanks for your comment and we hope you enjoy your trip to Mexico. Hi we are traveling to Cancun next week and I am wondering about reported cases of Zika. I am currently not pregnant, but hope to be in the near future. Any info would be great. Thanks. While it seems to be decreasing in some areas, there is still Zika present! May not be a good idea to visit if you’re pregnant, unless absolutely necessary. Column 1 shows cases in 2015-2016, column 2 shows cases in 2017, column 3 shows the total for all of those years. Note: Page 1 appears to be general cases of Zika virus, whereas page 2 appears to refer only to cases in pregnant women. I also presume there are some cases that go undiagnosed/unreported…the virus supposedly doesn’t show symptoms in everyone infected. Thanks for your comment and you’re right, the report only shows information by state or province (if the information is for each town and city the document will be too long) and as you can see in most of the states the numbers of cases confirmed are going down, this is basically because either the government, companies, and people are working together to eradicate the mosquitos breedings. In addition, last year the World Health Organization declared the Zika is no longer global health emergency so if you take normal precautions like using an insect repellent you reduce the risk of being biting by a mosquito. Thank you for reaching out to us, about your comment and according to the Zika report issued every week by the Health Secretary in Mexico. There are no cases reported in the State of Colima. Thank you for reaching out to us, about your question, there are just 6 cases reported in the whole state of Quintana Roo according to the information issued by the Hearth Secretary in Mexico. Hi, I’m planning to go to Mexico City and Oaxaca for dia de los muertos and am 6 weeks pregnant. Should I be concerned? Thank you. Hi there, I plan to travel to the Mayan riviera in November and I’ll be 12 weeks pregnant. Are there any cases specifically in the Mayan riviera? First of all, thanks for reaching out to us and about your question, there are just a few confirmed cases (7 cases) of Zika in the whole state of Quintana Roo. If there something else I can do for you, please let us know. Hello Sabrina and thank you to reach out to us. My husband and I traveled to Ixtapa last week from Malawi. We have been trying to get pregnant and we completely forgot about the Zika risk and now we are in complete panic. A Doctor from Ixtapa told us that the risk was minimal this year as there hasn’t been an outbreak and we cant get tested in our country. Do you you have any advice for us? We hope you had had a wonderful time in Mexico, about your concern and how the doctor explained to you, Zika is no longer an outbreak emergency. In the following link, you will find the most updated report issued by the Health Secretary in Mexico today and as you will see the number of cases reported in the whole state of Guerrero is very low. Thanks for your comment and reach out to us, according to the most updated report issued by the Health Secretary in Mexico, there are just 7 cases reported in the whole state of Quintana Roo. We hope this information will be useful and spend a wonderful time in Mexico. Hello. We are potentially traveling to the Riviera Nayarit area in early December. I am pregnant. Can you please send me the most recent update you can provide in regards to the number of cases of Zika (or other illnesses I should be cautious of) so that we can look at the information? Thank you! We hope this information will be useful. Which report should I trust? Why is there such a huge difference (e.g., 102 vs. 7)? Thanks! Thanks for this report, it’s very interesting. About your concern, this report is about Dengue in Mexico and not about Zika that’s the reason of the difference. We are thinking of going to Los Cabos. Is Zika still there? Also, is there a better time of the year where mosquitos are less prevalent. I understand its better to travel there around April or May where mosquitos are minimal. Lastly, do moquitos tend to be less at the resorts that are on the ocean? Thank you for your help. Thanks for your comment and reaching out to us, about your doubts. On the whole state of Baja California Sur, there are just 5 confirmed cases of Zika. The mosquitos rates are less during the fall and winter due to the raining season has ended but as part of prevention to avoid the mosquitos propagation, most of the hotels go with the Health Secretary campaigns to eradicate the mosquitoes breeding. I’m supposed to be going to Michoacan, MX in December for about 2 weeks and will be around 10 weeks pregnant. Are mosquitoes minimal at that time? Also is there anything else that I should be cautious of? Thank you for your response!! Do you by any chance know when the last case was reported there? As well the link you provided does not work. The information is updated every week but according to the most updated report, the number of cases of Zika in Michoacan keeps in 6. The link above change every week, but in this link https://www.gob.mx/salud/documentos/casos-confirmados-de-infeccion-por-virus-zika-2017 you will be able to track the most updated information every week. I appreciate your frequent responds to our concerns. We too wish to go to Cozumel in January and I was wondering about the situation and case numbers there. I could not find any recent information. Thanks for reaching out to us, according to the official report issued by the health secretary in Mexico. there are just 7 cases of Zika confirmed in the whole state of Quintana Roo. We hope you find this information helpful and enjoy your stay in Mexico. We went to Peurtoa Vallarta, Mazatlan, and Cabo last week. We had a few bug bites. If bitten (we do not know by what), are we to assume we have Zika? The flyer from the trip said that symptoms would occur 12-15 days after infection, but various websites are saying 2-7 days. Thanks for reaching out to us, about your doubts, not all the mosquitos transmit this virus but if you start feeling some symptoms we recommend you to visit your doctor and confirm if you got or not the virus. The most recent PAHO report on Mexico says there have been 334 reported cases of pregnant women with Zika in Quintana Roo total from 2015-2017. How can that number be so drastically different from your source? So hard to make a decision when “reliable” sources contradict each other. Thank you for your comment, about your doubts, we are not counting the total number of cases from 2015 to 2017 because of since November 18, 2016, Zika was declared no longer a global health emergency by the World Health Organization. 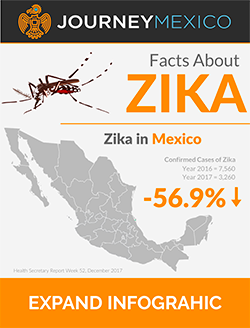 And according to the most recent report issued by the health secretary in Mexico, the number of cases of Zika in Quintana Roo (2017) are just 7.
we hope the links provided helps you to better compare the actual situation in Mexico. Hi im going to the Rivera Mayan in January.. we also plan on going the Chechen itsa.. any zika i should be worried about.. i will be 7 months pregnant.. Thank you for reaching out to us, according to the most recent report issued by the Health Secretary in Mexico, this year, there are just 7 confirmed cases of Zika in the whole state of Quintana Roo. But we highly recommend following the general recommendations to avoid mosquito bites and you can enjoy your trip to Mexico. Considering a trip to Cancun in April with my kids. Are there alot of mosquitos that time of year and can you update us on confirmed cases of zika in cancun for 2017? Does it appear to be going down? Great news you have consider Mexico as your next family vacation plan. About your doubts, the number of cases of Zika in the state of Quintana Roo has gone down. If there something else we can do for you, do not hesitate to reach out to us again. According to the health secretary in Mexico, there are no confirmed cases of Zika in the state of Chihuahua. My husband and I are planning to go to Cancun, Mexico Jan 6th, 2018 however we are trying to get pregnant. What is the likelihood of getting Zika if we go? Thanks for reaching out to us, the number of confirmed cases of Zika in Quintana Roo are going down, as you can see in the following link https://www.gob.mx/cms/uploads/attachment/file/279196/Cuadro_Casos_ZIKA_y_Emb_sem_47_2017.pdf there are just 7 cases of Zika in the whole state. Hello, my husband just got back from Playa Del Carmen this past Sunday. He stayed at Paradisus Playa Del Carmen La Perla. He did not leave the resort but he did get one mosquito bite. He has not had any symptoms of zika, but what are the chances it is zika? We are ttc so I am just wondering if we really need to wait the 6 months now. Thanks! Thanks for your comment, about your concern, Quintana Roo is one of the states with less confirmed cases of Zika and the symptoms began a few days after you get the virus (between 2 or 12 days) but if your husband start feeling any symptoms we recommend to visit your doctor and discard that he got Zika. Can you tell us whats happening in the Cancun area and the reported cases for 2017? What are the trends and are there fewer cases of Zika than in 2016? Additionally, how many have been reported in the last month? We are considering a trip there in April and want to know if it is safe. I am currently 4 months pregnant and planning a family trip to Mexico City, Puebla, and Acapulco. Of course I have read the precautions for pregnant women and am in the process of making the personal decision about the risk of travel. What are the reported cases in those areas? Jennifer, the numbers are showing for the whole state and no particular cities and it’s important to know that during the winter the mosquitos rate is significantly low because there are no frequently rains and the temperature is lower, so the mosquito cannot reproduce. Hi! I’m pregnant and thinking about travelling in Baja California Sur in January- February. do you know the risk for Zika virus in this area at this time of the year? Thanks for reaching out to us, at the following link you can see the official report issued by the Health Secretary in Mexico. As you can see there have been a few cases reported, but the report shows the cases for the whole state and during the winter the mosquito rate is lower because the weather condition is not optimal for its reproduction. I’m debating a March 2018 trip to Mexico City. What do you anticipate the Zika concerns to be then? Hi Selina! The mosquitoes that spread Zika usually do not live at elevations above 6,500 feet because of environmental conditions. 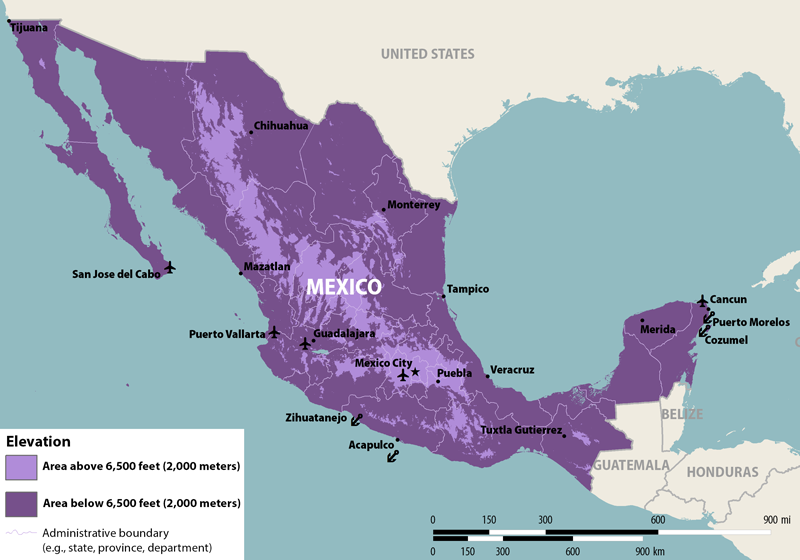 Mexico City is located above this elevation so there is minimal risk of getting Zika from a mosquito. Hope this helps and let us know if there’s anything we can do for you!